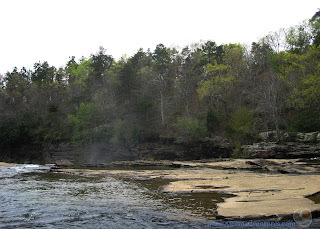 The Little River Canyon National Preserve in Northeastern Alabama is an overlooked natural wonder. 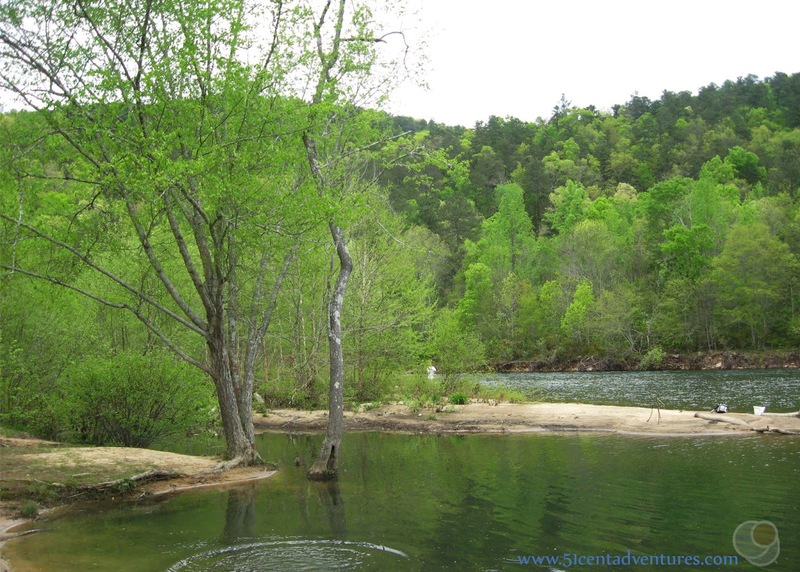 The entire canyon is situated on top of Lookout Mountain, making this one of the only rivers in the world that flows entirely on a mountain. The crown jewels of the canyon are the Little River Falls which are easily accessible from Highway 35. 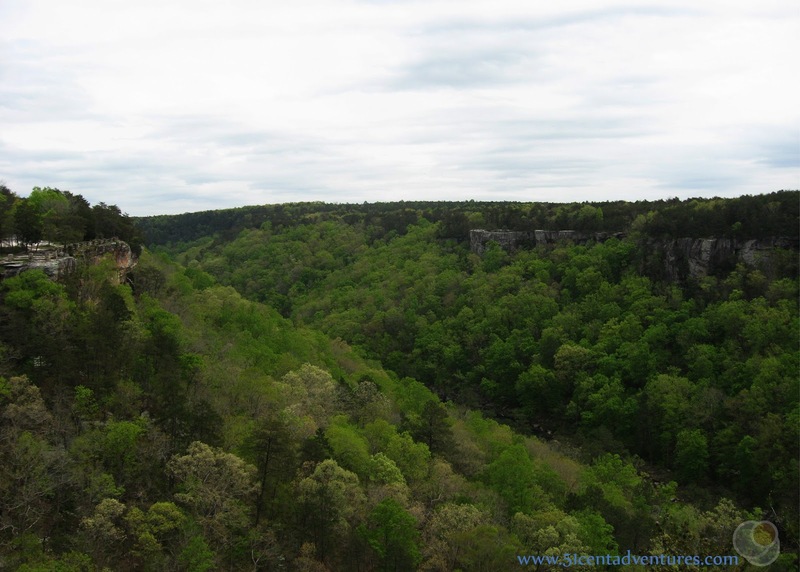 The canyon walls are covered in trees providing beautiful green vistas every way you look. The 23 mile Scenic Drive runs along the western rim of the canyon and has many pull outs that allow you to stop and take in the scenery. Operating Seasons and Hours: The park is open from sunrise to sunset all year long. The Canyon Center is open from 10:00 to 4:00 daily. This was the second stop of the third day of our road trip to the Lookout Mountain area of Alabama in April of 2016. 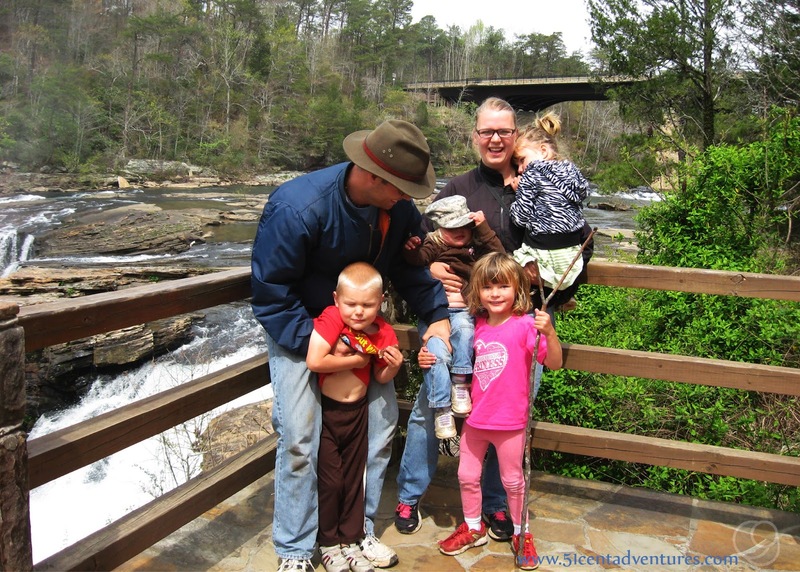 My family went on a quick hike to a waterfall in Desoto State Park and then we drove 11 miles to the south to the Little River Canyon. 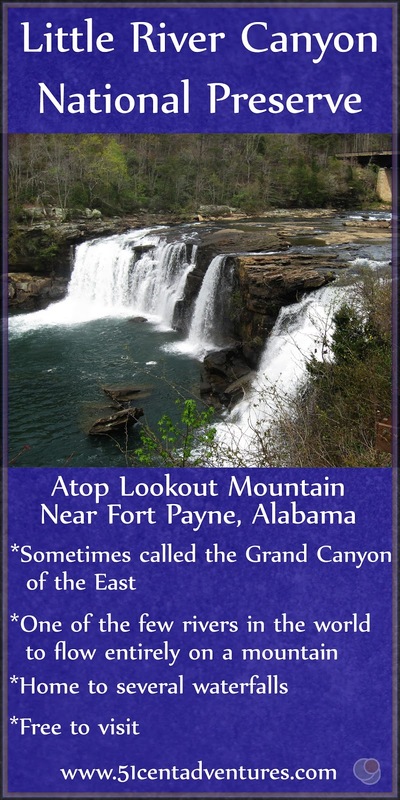 I'd read a little bit about the Little River Canyon in my Alabama Guidebook, but mostly it was just mentioned in passing. So as my family drove into the area via Highway 35 I didn't know what to expect or where to go first. All of a sudden we drove onto a bridge that went over the Little River. We could see what looked like a waterfall. My husband hurried to park in the parking lot on the east side of the canyon. We got our kids out of the car, and walked on the short trail that led to an overlook. What we discovered took my breath away. We saw a wide waterfall cascading down a cliff. 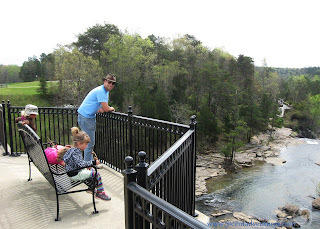 An older couple had walked down to the overlook with us and they were enchanted with our kids. They thought it was so cute how close in age all four kids were. 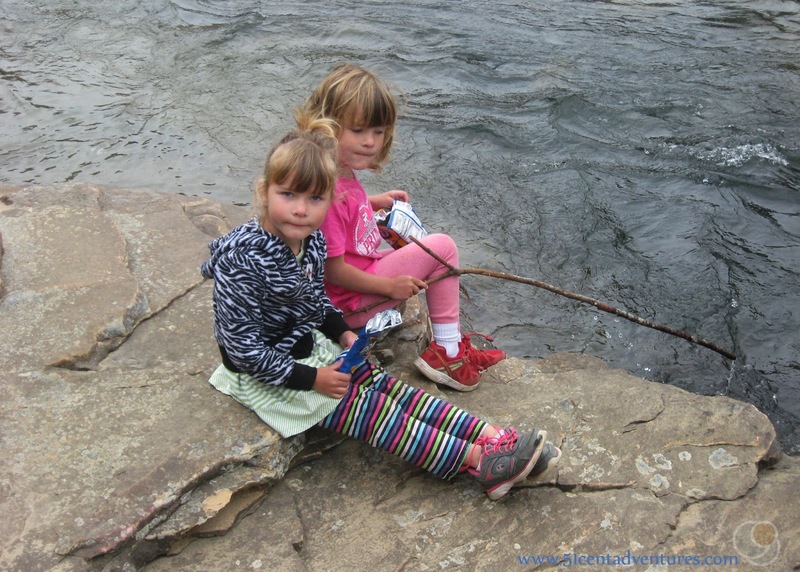 They thought it was great that we were teaching our kids to love the outdoors. They also offered to take a family picture. And they were very understanding when this was the best we could do with getting our kids to pose for the picture. I love it when we run into understanding people. 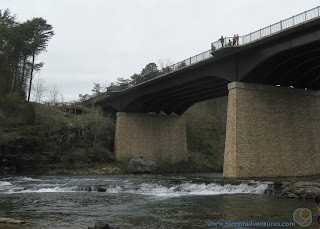 There was a pedestrian walkway on the bridge that we'd crossed earlier in the car. So of course we had to walk across it. There were little viewing areas built right onto the bridge. They were rather unnerving to sit on. 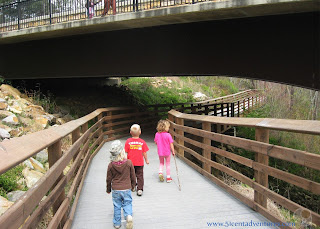 The bridge wrapped around itself on the other side and the kids thought it was cool to walk under. 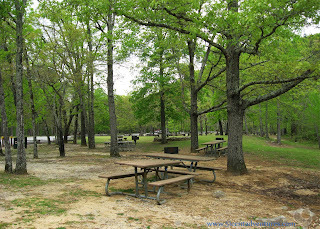 After a little while the walkway turned into a trail Eventually it would have led us to the Visitor Center for the Little River Canyon which is managed by the National Parks Service. But we turned around before we went that far. We made our way back across the bridge. There was a small field of dandelions. 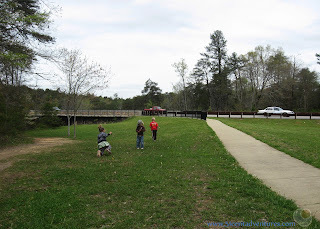 The kids played with those while my husband ran to the car to grab our picnic food. 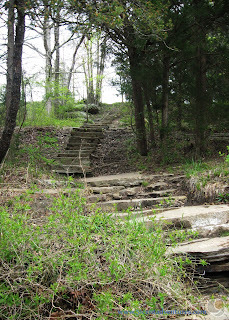 After the picnic my husband took our five year old twins down some stone steps to the water's edge. This was the start of a trail which runs along the rivers edge. They had a great view of the massive highway bridge. And they had a great view of the water. The edge of the waterfall was just a few feet away. But they were careful not to get too close. There were many signs warning people of the dangers of getting too near the edges of these cliffs. Apparently there have had to be several rescues of adventurous climbers who had fallen over the edge. Eventually we got back in the car and decided to take a drive along the Scenic Drive section of Highway 176 which bordered the western side of the Little River Canyon. One of the things that had surprised me the most about Lookout Mountain was it's lack of any good places to actually lookout at the scenery. That was not the case in the Little River Canyon area. There were 8 overlooks along the side of Highway 176. 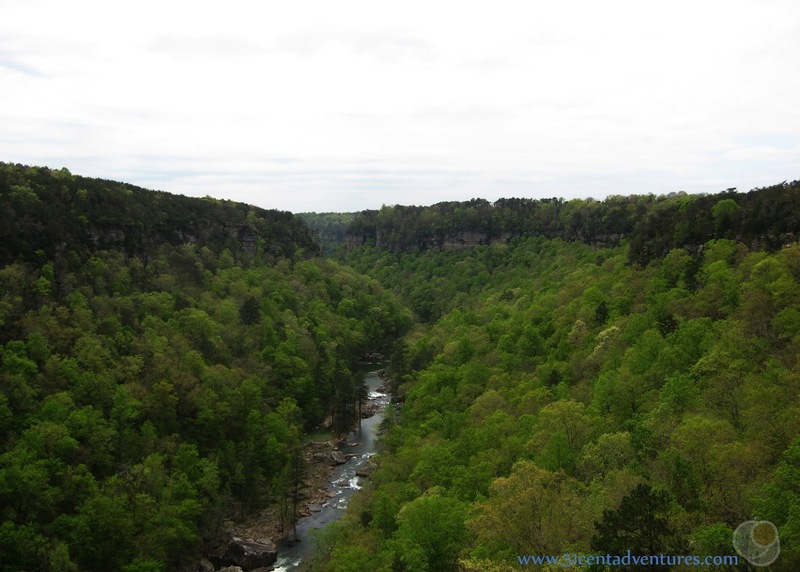 We were able to see wonderful views of the Little River Canyon and the Little River itself. I was amazed at how many trees there were. And how green everything was. At one overlook we were able to see people kayaking down the water. We watched them navigate around big rocks. 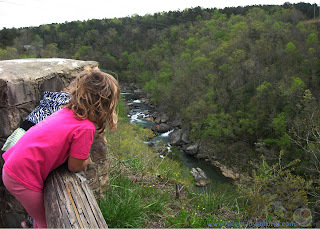 We stopped at just about every overlook and enjoyed the beautiful scenery. We were even able to see another waterfall. 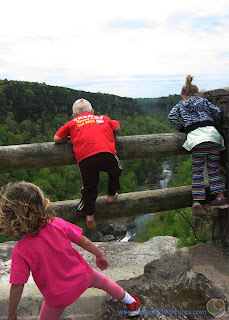 This was Graces High Falls. This is a seasonal waterfall so it's not always visible. 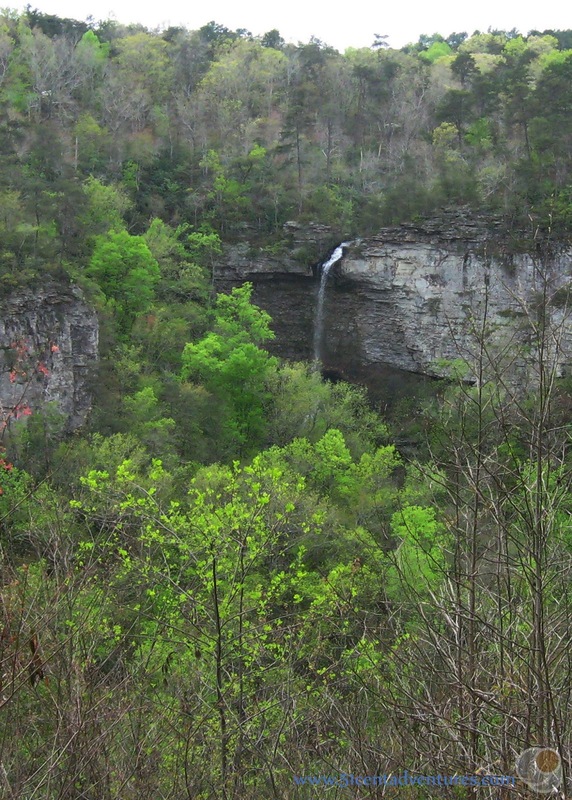 At 133 feet it is Alabama's highest above ground waterfall. Which begs the question, where is Alabama's highest below ground waterfall? I'd love to know so please leave me a comment if you happen to know the answer. Usually we play a movie in our DVD player while we drive, but we wanted the kids to enjoy the view. So we turned on the soundtrack for Indiana Jones instead. That was really fun to listen to as we rounded curves and drove near steep edges. After 11 miles we came to Eberhart Point. There was a parking area and bathrooms at this spot. 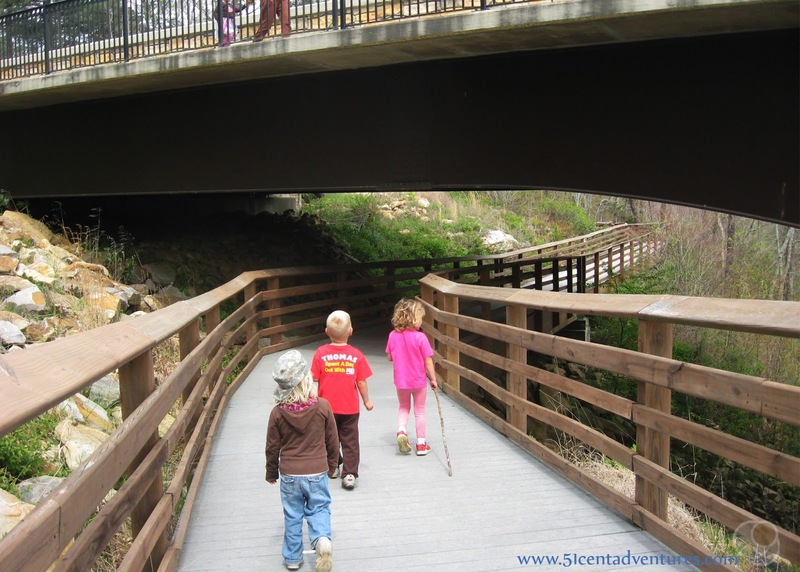 The Eberhart trail is 3/4ths of a mile long. It takes you from the canyon rim down to the water below. Our children might have done okay on the way down, but there was no way they'd make it back up so we decided to stay in the car. 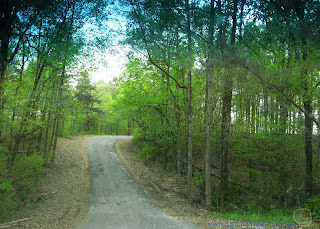 Eberhart Point is also the location for a fork in the road. Highway 176 went off in one direction while a much steeper road, Highway 148, stayed close to the canyon rim. There was a sign advising RV's and motorcycles to stay on Highway 176. We decided to take the steeper road and so we turned onto Highway 148. It was full of hills and was really fun (if just a little bit scary) to drive on. We enjoyed 12 miles of twists and turns, steep hills, and slightly rutted roads. Somewhere along the way Highway 148 became Highway 275. Our adventure ended at a peaceful place known as Canyon Mouth Park. There is a $3 fee for this area, however no one was on duty to take the fee. We didn't worry about it too much since our National Park Pass probably covered the fee anyway. This area was so peaceful and private. There were maybe a total of 3 other cars in the large parking area. One of the twins had fallen asleep during our drive. She stayed asleep even after my husband parked the car. So he took the three other kids down to the water while I stayed in the car and took a nap with my daughter. 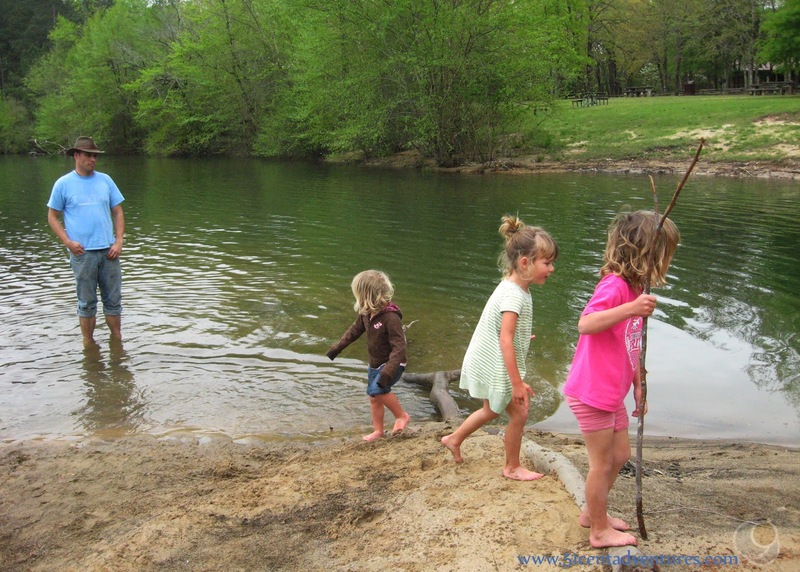 After about an hour my daughter and I woke up and discovered that my husband had taken the kids out to the little sandbar/island a few feet from shore. We carefully made our way to join them. All the kids had fun playing with the water, sand, and rocks. We stayed in this area for a long time. It felt like we'd discovered paradise. Everything was just so beautiful and calm. Eventually though we had to get going. There were mundain things like doing laundry and making dinner to worry about. Plus we'd promised our son that we'd visit the Fort Payne Train Depot Museum that day. So we had to say goodbye to the Little River Canyon. 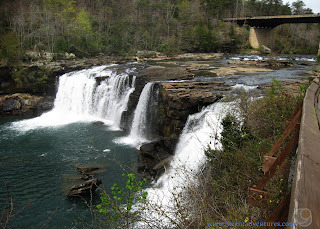 Recommendation: As with everything else on Lookout Mountain I highly recommend that you visit the Little River Canyon. This area is absolutely beautiful. 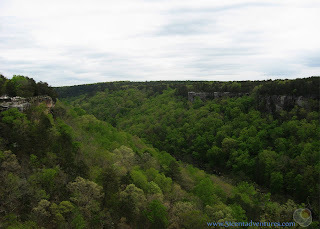 Canyons like this are rather rare in the Southeast so you should definitely visit this one if you can. Directions: The Little River Canyon Falls, the Scenic Dive, and the Canyon Center can all be accessed via Highway 35. Canyon Mouth Park is best accessed via back roads to the south. 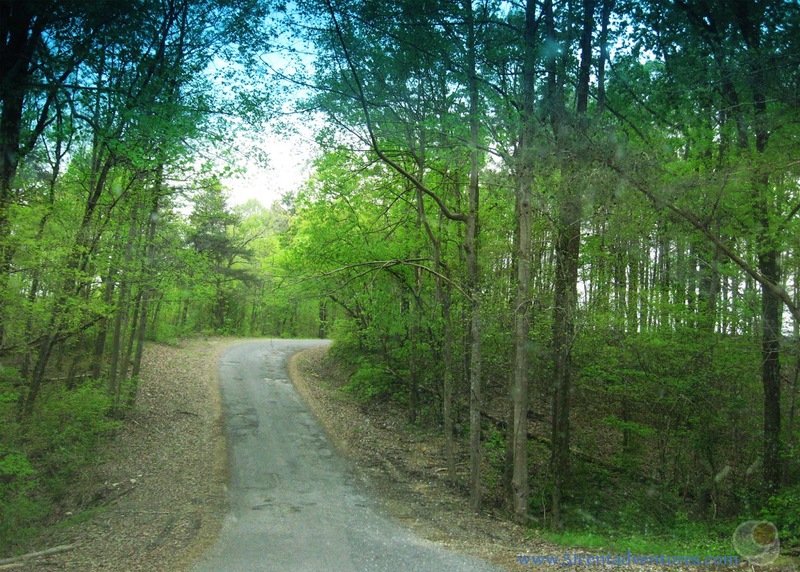 Though it is possible to reach it from the scenic drive if you have a vehicle that can handle the steep hills. The Scenic Drive is also known as Highway 176. 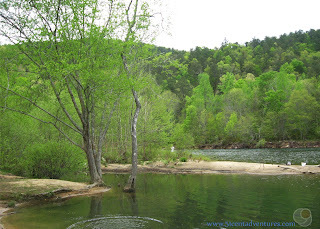 Places Nearby: Manitou Cave is located on Highway 176 only a few miles from the Little River Canyon. This cave is operated by True Adventure Sports. They promise to give you a cave experience involving crawling on your hands and knees, and through tight tunnels. Tours start at $34.50 per person and last from 3 to 5 hours. All gear is included in the cost of your ticket. In addition to the cave tours True Adventure Sports also offers other adventure packages that include activities such as hiking, rappelling, rock climbing, bouldering, and survival training. This place is definitely on my list of places to check out when the kids are a little older. Next Stop: Our next stop was the Fort Payne Depot Museum where my son was happy to see some trains.